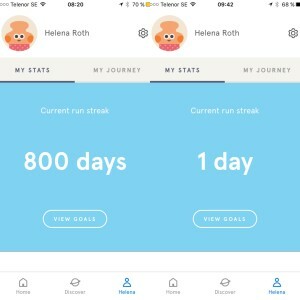 As I did my daily morning Headspace-meditation, my runstreak was reset from 800+ days to 1. Oh well. Perhaps I forgot yesterday? I might well have. Thing is, I can’t check. The Headspace-app allows me to see my Headspace-journey, but only what sessions I’ve done in which order, not the time/date for each (or at least, the last one). I know I did my 800th meditation in a row on Tuesday because I screenshotted and Instagrammed that joyous occation. I did the same today (less joyous though it might have been), and figure I will simply get back on the horse, but have a small nagging sensation of having done a quick Restore-session yesterday morning as well, so I sent off a rambling email to Headspace Support. My Runstreak was reset today and I have a faint memory of doing a quick Restore-session yesterday (ie Thursday the 3rd of August). However as its still n o t possible to get the time stamp in my Journey (please add this! A feature like that in iMessage or Messenger – hold and time/date appears) I wonder if it was actually the 2nd that I did the last session previous to my quicky today (restore Friday 4th). The o n l y good thing about having lost my runstreak of 800 days is that I will actually get some rewards again – you do Realize you are actually rewarding people for not keeping to their runstreak by sending out give-away-headspace for 15-30-90 etc up to 365 days and then zip, nada, zilch. And I don’t even get a Goal for my efforts. Oh well. Going slightly off topic here but as I wrote I might as well give you what’s in my mind. The old buddy-visual was better than the new one also, but thanks for re-adding buddy-runstreak at least. 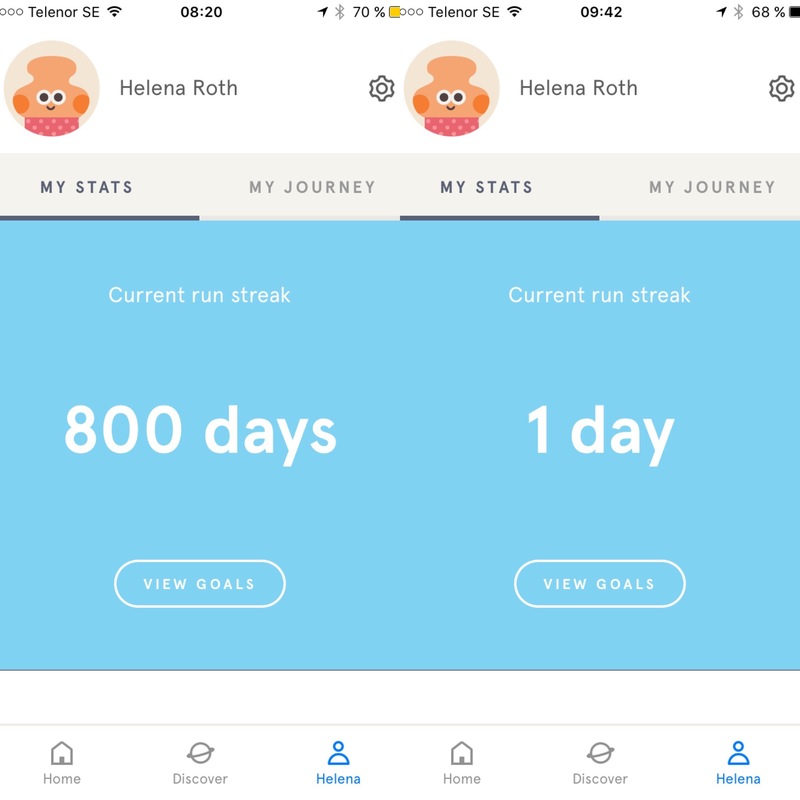 A while ago, I got into my head thinking “how awful it would be if I lost my pretty and long Headspace runstreak, which is so much moore impressive than it was last time I lost it“, so even though I bothered with sending the email, I am not upset, but rather am quite happy at observing my reaction at seeing the number 1 in my runstreak: Oh well. I must have forgotten to Headspace yesterday. Not beating myself up. Not blaming myself for being stupid to loose my runstreak. Nothing of the sort. Just a simple “Oh well”, knowing it doesn’t really mean anything. I will continue doing my Headspace, because I like giving myself the gift of a few minutes that are mine, solely mine, each day.